Recently, I started building new projects on Drupal 8. Everyday, I spent some time on checking the progress of a few D8 issues that I needed and the overall D8 progress. I thought it might be fun to have some progress numbers to show up on my Moto 360 Watch, and it's almost Christmas, so I decided to build my own Watch Face for Android Wear to monitor Drupal 8 Release. It has a simple (analog) watch. Every 6 hours (this interval is set by Drupal Release Date Project to crawl Drupal.org), the watch sends the signal to the companion handheld device to download the new data. The handheld device uses Retrofit library (built by Square) to efficiently access Drupal Release Date Project API and parse the JSON data. The handheld device calls the Data Layer API (the actual communication is over Bluetooth), and then to sync the data to Android Watch. 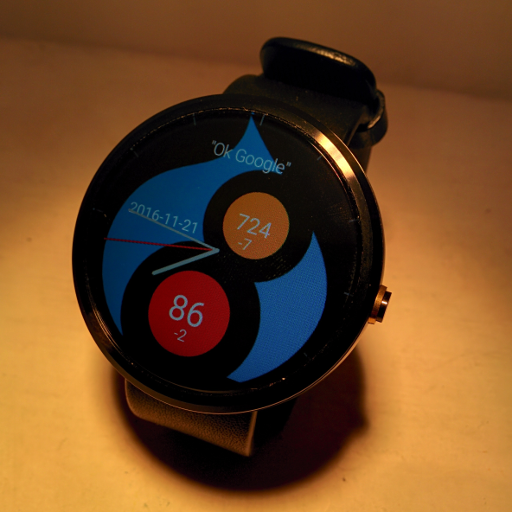 The Android Wear app draws data on the watch face. The Watch Face App is available on Google Play. Merry Christmas! and if you have ways to improve or extend the project, please use the comments below to enlighten me!